"It brought tears to my eyes when I heard the nominations because all I could think about was the concerts that we had on tour this year and the stories that people had come up to me personally to tell me after they listened to the album — how it's made them feel, how it's made them feel seen and heard and celebrated." — Janelle Monae, nominated for album of the year and best music video, said in an interview. "I feel so grateful. Not saying that I feel deserving, but I feel like a lot of very talented people and artists don't necessarily get the recognition that they always deserve. Real artistry is not always recognized ... It just feels like all my hard work has paid off to be recognized for all those things in such a big way. The Grammys is something I've dreamt about as a kid, something I think every artist dreams about. It's such a blessing. I really don't have words for it. All the stars are aligning for me. I only have God to thank." 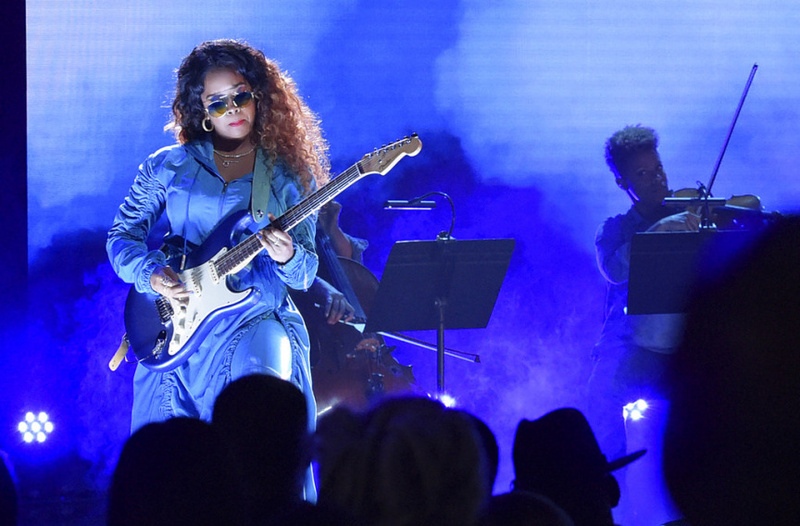 — said H.E.R., nominated for album of the year, best new artist, best R&B album, best R&B performance and best R&B song. "Art is thriving. I've been so inspired by the creative climate this year has generated, and I'm SO thankful to be nominated alongside some truly brilliant & innovative artists. Thank you from the bottom of my heart." — Kacey Musgraves, nominated for album of the year, best county solo performance, best country song and best country album, said on Twitter. "I usually can't shut up but right now I'm speechless. THANK YOU THANK YOU THANK YOU" - Camila Cabello, nominated for best pop vocal album and best pop solo performance, posted on Instagram. "I guess I'm going to the Grammys." — Chris Rock, nominated for best comedy album, said on Instagram. "Such a real freaking honour, shock and surprise to be nominated for 'electricity' I truly love this song so much" — Mark Ronson, nominated for three Grammys, said on Twitter. "THANK YOU" — P!nk, nominated for best pop vocal album, posted on Twitter. "The Marathon Continues" — Nipsey Hussle, whose album "Victory Lap is nominated for best rap album, posted on Instagram. "TWO NOMINATIONS TWO GRAMMY NOMINATIONS IM SO HAPPY BUT I CANT STOP CRYIN I CANT BELIEVE IT!!!" — Dua Lipa, nominated for best new artist and best dance recording, said on Twitter. "THIS IS INSANE. I DON'T KNOW WHAT TO SAY. 5 NOMINATIONS?????" — H.E.R. on Twitter, reacting earlier to her nominations. "Song of the year and best r&b song be de da doooooo" — Ella Mai, whose song "Boo'd Up" is nominated in both categories, said on Twitter. "Unbelievable, speechless right now. I LOVE YOU." — Shawn Mendes, nominated for song of the year and best pop vocal album, posted on Twitter. "WHY DON'T YOU JUST MEET ME AT THE GRAMMYS! 5 nominations?! I am so honored @RecordingAcad and so proud of all my GRAMMY NOMINATED FRIENDS." — Maren Morris, nominee for record of the year, song of the year, best pop duo/group performance, best country solo performance/country and best country song, said on Twitter. "Woke up filled with hope. Dreams come true y'all... thank you @xtina. I love you so much." — Demi Lovato, nominated for best pop duo/group performance for "Fall in Line" her feature with Christina Aguilera, posted on Twitter. "You deserve it all and getting to work with you was its own award for me @ddlovato. There's no one I'd rather share this with!!!" - Aguilera tweeted in response to Lovato's initial post. "Two?!" — Jonathan McReynolds, a nominee for best gospel performance song and best gospel album, said on Instagram. "What a humbling list of friends and creative influences to be on. Thank you @RecordingAcad!" — Patton Oswalt, nominated for best comedy album, said on Twitter. "#DreamComeTrue" — Bebe Rexha, nominated for best new artist, posted in an Instagram video .